Show who's calling the shots with the MADE Cotton Club Limited Edition deck. These exquisite tuck boxes are foiled stamped and feature stunning hand-illustrated designs of the power and wealth that is all Mafia. 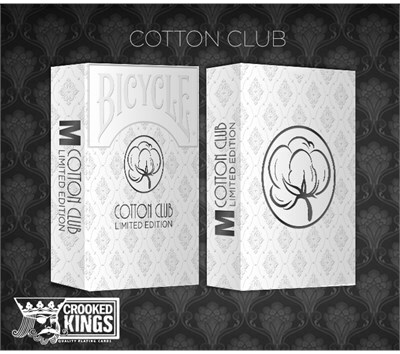 Cotton Club Limited Edition Tuck Box: These decks are beautiful, elegant, classy, and really stand out among a crowd! They are ornately detailed and more than 80% embossed, and feature red foil stamping that REALLY accent the artwork! Custom numbered seal! Ace of Spades:This stylized depiction features two pistols, two daggers, and bullet starbursts within an artistically designed spade. King of Spades:The thin mustache and hidden eyes of this regal King says it all. His guarded nature makes him a master at bluffs. Queen of Spades:The lady of the house keeps the boys in-line with her stylish bob and fashionable headpiece. Exuding status with her ruby red lips and layered necklace, this lady will show you how to win victory with style. Jack of Spades:Cool as a cucumber, this hired hit man knows how to defend and win in style. Ace of Diamonds:The shattered glass of this red mobster mobile draws attention away from the bullet holes that riddle the car's front. Ride all the way to your victory with far less damage. King of Diamonds:Smoking his cigar with a black overcoat casually draped over his shoulders, this muscle is ready to show he knows how to get his hands dirty. Jack of Diamonds:This standup friend of ours took a bullet protecting the boss. Loyal like no other, let him work your next game. Queen of Diamonds:As beautiful as she is deadly, this mob wife is prepared to help you put your best face forward. The geometric design of the Cotton Club Limited Edition card backs enclose a central pillar that is symbolic of both an impressive city skyscraper and the architecture of a family on the rise.